These pictures are stacks of confocal images of two different actinotroch larvae of the horseshoe worm Phoronis vancouverensis (Phylum Phoronida). P. vancouverensis is a rather inconspicuous phoronid which lives in small (a few centimeters long) muddy tubes in clumps, attached to some sort of hard substratum (a rock, a floating dock) often in somewhat muddy surroundings. This species broods its larvae in the crown of tentacles, called the lophophore. I gently shook the larvae out of the lophophore of an adult and prepared them for confocal microscopy with my students while teaching the Comparative Embryology course at the Friday Harbor Labs in the Summer 2007. We preserved the larvae and stained them with fluorescent phallodin (a toxin, derived from the deathcap mushroom Amanita phalloides), which binds to filamentous actin. Muscles are highlighted because they are full of actin, a protein which enables cellular contractility. So, most of what you see on these pictures are muscle fibers. There is also quite a bit of actin in the cell cortex (the region of the cytoplasm adjacent to the plasma membrane). So, the outlines of epidermal cells are often also labeled with phalloidin. The anterior end of the larva has a large preoral hood (upper right). The mouth opens under the hood. The first picture is a side view. The second picture is a ventral view. The hood is lifted, and we are looking straight into the larval mouth. 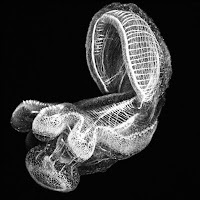 Posterior to the mouth is a set of tentacles, which bear a ciliated band used in capturing microscopic food particles. At the posterior end (bottom left) is another ring of ciliated cells, which propels the larva through the water. 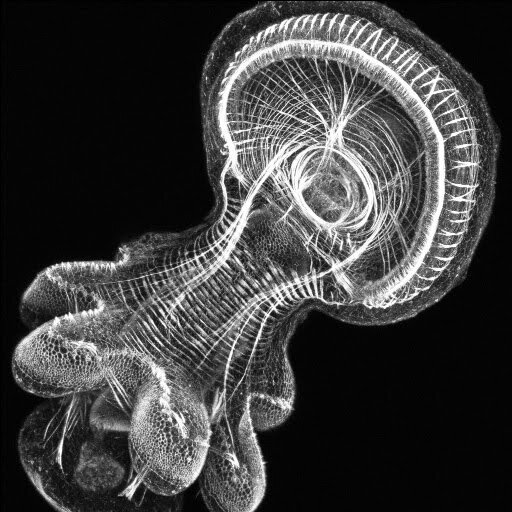 You cannot see the cilia in this preparation (because they are not fluorescent), but you can see the outlines of the small cells which compose the larval ciliated bands.